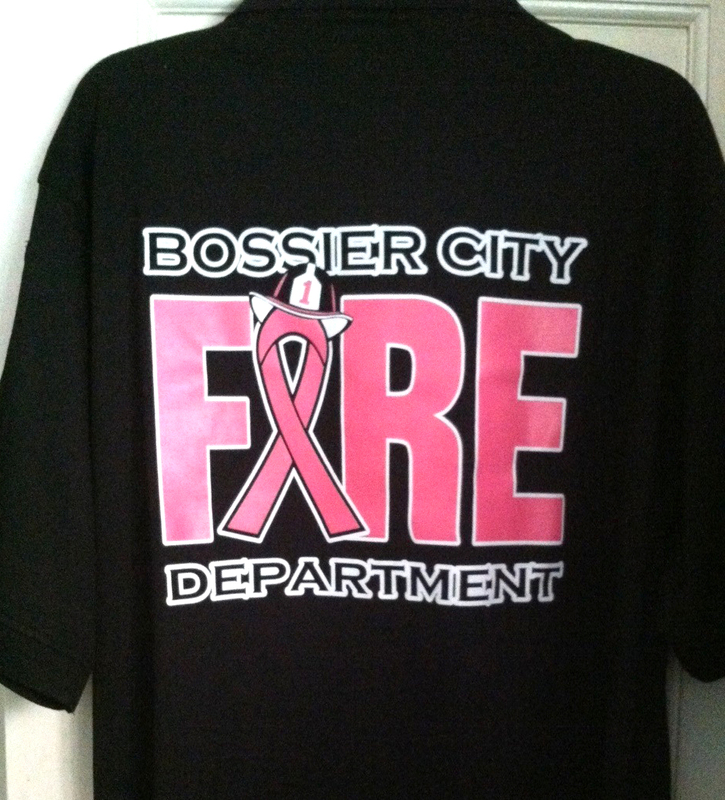 Members of the Bossier City Fire Department will be sporting special duty shirts during the month of October in support of Breast Cancer Awareness month. The shirts are black pullover polos that feature an embroidered pink BCFD patch, pink ribbon on the right sleeve, name and rank in pink and large pink ribbon on the back. Chief Brad Zagone gave Bossier City firefighters the option to purchase the shirts at their own expense to wear while on duty during October. About two-thirds of the department took Chief Zagone up on his offer and will start wearing the shirts tomorrow. t-shirts and raised approximately $3000 for Susan G. Komen. The t-shirts are available to the public at just $15 each with half of the proceeds going to Susan G. Komen. The rest of the proceeds cover the cost of the shirts. T-shirt orders will continue until 5 p.m. this Friday, October 4, 2013. Orders can be placed by calling the Bossier City Fire Department at (318) 741-8700. The black polo duty shirts are not available for sale to the public.